Cafe Antarsia Ensemble shared a link. 1 month 1 week ago. Cafe Antarsia Ensemble shared a post. 7 months 1 week ago. Cafe Antarsia Ensemble shared a photo. 8 months 1 week ago. Cafe Antarsia Ensemble shared a memory. Missing this! 11 months 1 week ago. Cafe Antarsia Ensemble updated their cover photo. 1 year 8 months ago. 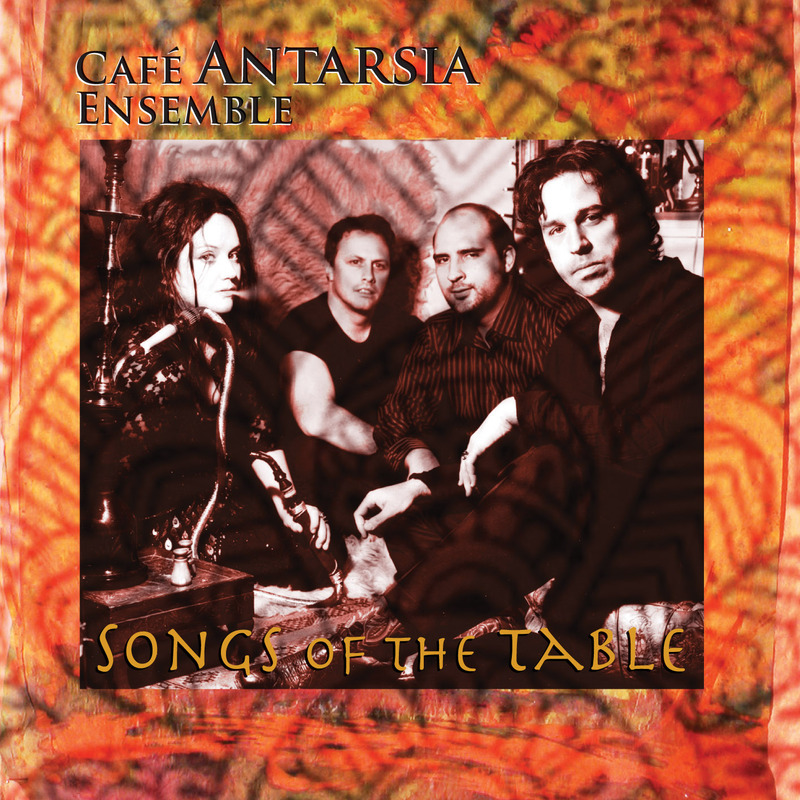 CAFÉ ANTARSIA ENSEMBLE’s Songs Of The Table is a high passion “world folk” album inspired by Greek Rebetiko, Kritika rebel songs and Balkan Rroma/Gypsy music, rooted in the rhythms of Middle Eastern percussion and Americana folk. The CD was recorded in the summer of 2006 in the sanctuary of Pagosa Springs, Colorado, produced by Kevin Johnson after Nikos Brisco and Ruth Margraff returned from a four month Fulbright “New Opera” fellowship in Athens, Thessaloniki, Paros and Crete (Greece). The CD features exotic, handmade instruments such as French Gypsy Guitars, Greek Bouzouki, Tzouras and Baglama, Cretan Laouto, Accordion, Tabla, Riq and frame drum. Greek-Texan composer/songwriter Nikos Brisco's hauntingly urgent melodies are complemented beautifully by the panoramic poetics and portrait-driven lyrics of playwright/performer Ruth Margraff. The album’s ornaments and vocals owe much to wandering the maketplaces of Sarajevo, Dubrovnik and Belgrade in the former Yugoslavia as well as to the painted darkness of New York City’s downtown theaters and epic taverns all the way from Astoria, Queens to the timeless island of Crete. CAFÉ ANTARSIA ENSEMBLE (CAE) was created in NYC in 2002 when Brisco and Margraff invited Egyptian-American percussionist Rami El-Aasser to join them for the live scoring of their first “world folk opera” Judges 19: Black Lung Exhaling created in Texas and NYC and premiered at theater festivals in Moscow, Russia and Belgrade, Serbia. Brisco and Margraff both lived and studied Romani/Gypsy music, history and language with the Gourbeti tribe in Valjevo, Serbia in the summer 2004 and have been influenced by their teacher Dragan Ristic’s gypsy/jazz ensemble KAL, currently sweeping Europe. Adding Ron Riley’s rock steady rhythms and Delta slide, the Ensemble took their name CAFÉ ANTARSIA from the Greek word for “rebellious,” also the title of an opera they are writing based on the 1889 failed rebellion of Crete at the end of the Ottoman Empire, made famous by Nikos Kazantzakis’ novel Freedom or Death. CAE has toured together and performed internationally in Russia, Serbia, Croatia, Turkey, Greece, Czech Republic, Quebec, Hungary, Romania and Great Britain as well as all over New York and the USA. CAE is dedicated to coexistence through music and artistic exchange, striving to unite cultures in conflict elsewhere through live performance. CAE believes in fostering intuition, tradition and rebellion in a new world folk diaspora. The Ensemble has received awards from Meet The Composer, Arts International, Trust For Mutual Understanding, the Fulbright Foundation and TCG/ITI.